Toy Story That Time Forgot isn’t as good as Toy Story of Terror but it’s still a fun little short special where you get to see our old friends together again with a nicely constructed story and good voice work, in particular Kevin McKidd. Given the low $15 MSRP, this has the right amount of bonus material as well as good video/audio transfers to make it worth a purchase. 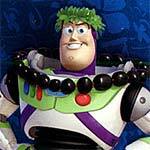 Toy Story of Terror is another solid entry in the franchise with some great humor and some decent, kid-friendly, terror. It’s also wonderful that they manage to get the cast back even in limited roles rather than go the cheaper/easier route with voice imitators. The Blu-ray release has excellent audio/video transfers and all things considered, there’s a fair amount of bonus material. 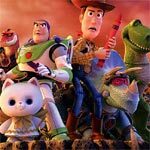 Toy Story 3 is a heartwarming, bittersweet and funny film that both kids and adults will absolutely love – and I would argue that the adults may find a more emotional impact especially if you were a child when the first film was released. The 3D Blu-ray itself has incredible video and audio which is to no surprise for a Pixar/Disney release. 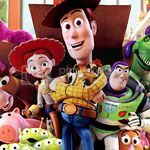 If for some reason you haven’t seen Toy Story or you haven’t seen it in years, there’s no better time to see it again, now in Blu-ray high-def with some decent extras to keep you occupied, plus both the audio and video are top notch and well worth the upgrade. With regards to the 3D Blu-ray, it was surprising to see something that was post converted to 3D looked so good. 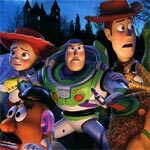 Toy Story 3 is a heartwarming, bittersweet and funny film that both kids and adults will absolutely love – and I would argue that the adults may find a more emotional impact especially if you were a child when the first film was released. Click on Page 2 for more screen caps.